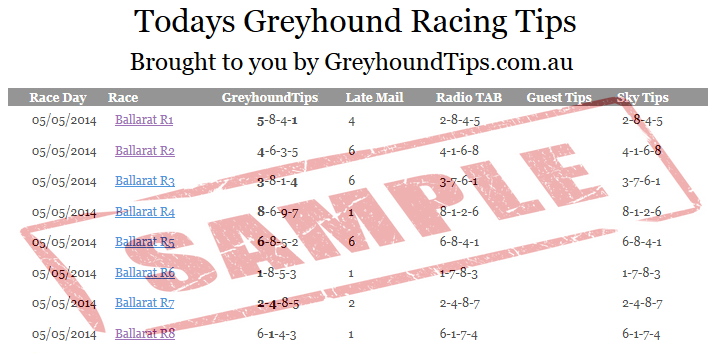 GreyhoundTips.com.au – is a professional punting service that provides a selection of top 8 Racing Tips. Australian Racing Tips also operates two other Website’s that provide Horse Racing and Harness Racing Tips for Members all across Australia. The formulas that are used to select our greyhound racing tips have been developed since 2005 and are regularly used by ourselves and our members to achieve a repeatable selection process. Many of our members will use our tips and build their own systems based on our selections, by doing this they know the same process will be used day in day out and they can build a repeatable betting system into their punting. Due to the variances involved in Greyhound racing, it is important to find a betting system that is consistent and reliable, and that is exactly what our service does.